This week there will be a bit of light blogging from yours truly since it’s one of those wonderfully weird weeks where multiple national bank holidays happen throughout the week, almost one after the other and for different reasons, so there is a great chance I will be spending most of the time offline rather than online. 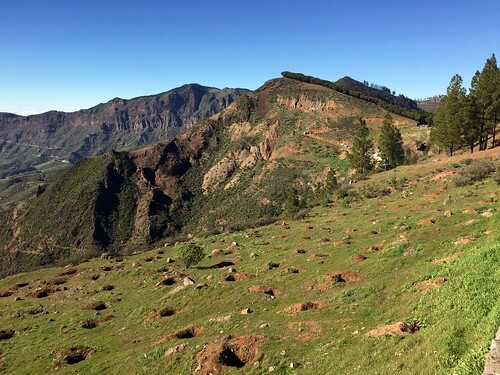 Perhaps, for those odd moments when I’m back online it may well be also the perfect opportunity for me to continue with the series of blog posts around ‘Gran Canaria – A Mini-Continent to Rediscover’ that I mentioned recently I would be writing about every weekend from then onwards. Well, this week already feels a little bit like a massively long weekend with this so-called ‘macro-puente’, so to get things going I will go ahead with the first recommendation of places to eat and dine in Gran Canaria and I will go for one of my favourite restaurants in the island that if I were to describe it with a short sentence it would be just this one: ‘A Treat to All Senses’. Welcome to Samsara! That incredibly amazing place that, once you try it out, it will trap you for good with plenty of unforgettable and intoxicating memories, enticing you to keep coming back over and over again! It’s one of those places where you would need to book a table well in advance, because it gets really busy pretty quick. 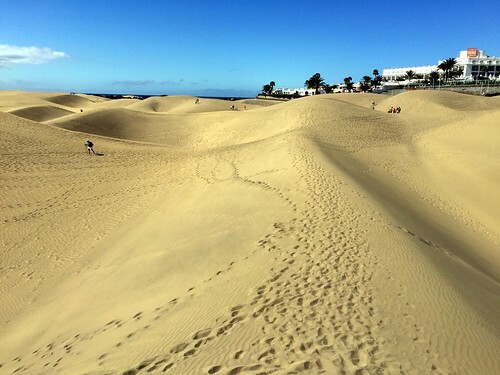 Once you are sorted out with the booking, what you would want to do is arrive way early, so you have a good opportunity to enjoy one of the most amazing long walks around the Maspalomas Lagoon that will definitely help out open up your appetite. And now you would be ready to enjoy an amazing experience. While going up the stairs you can already sense you are off to experience something pretty unique on its own. The atmosphere is very different to whatever you would find in the rest of the island. Something I could pretty well define as exotic, maybe even a tad mystical. Both the exquisite lounge area as well as the capacious restaurant are decorated in an oriental style that, at times, can be pretty overwhelming, but that, once you let your sense adjust accordingly, it’s as if you have just been taken into a completely different world even before you sit down. If it is the first time you go there, understand the world may have just slowed down a fair bit for you, because the owner (usually) will take his time to explain how the restaurant works. Pay attention, because that’s where it gets pretty interesting. 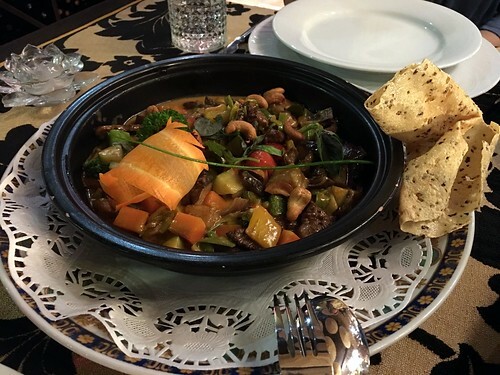 Samsara’s mantra is that one of sharing the food with the people going along with you. 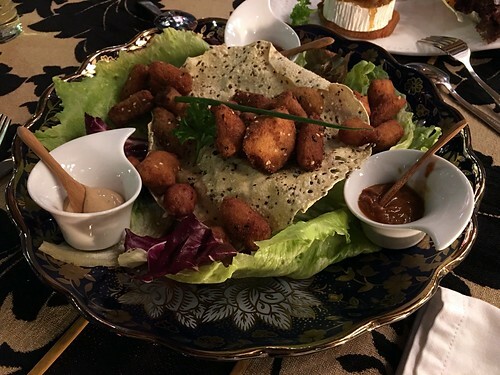 The portions are usually rather large, sufficing a single dish for two people and rather generously, as you can see from the pictures I have shared in this blog post. 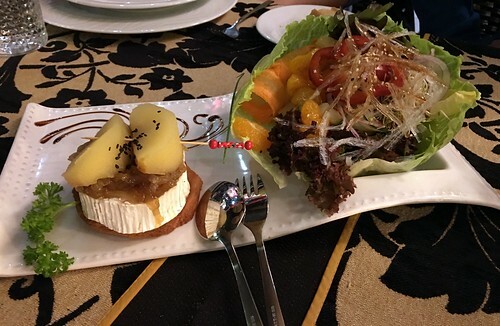 So asking for a starter, the main course and the dessert for two people would be a rather good option on its own and, believe me, you would have plenty of amazing food on the table. Be prepared to be wowed and multiple times! To describe the food experience would be a bit preposterous from my side, as I would probably spoil it all for you, so I won’t. But I will probably add Samsara is a rather special fusion place of the West with the Far East, and getting it just right, meaning the wonderful and rather delicate mixture of western ingredients with oriental flavours, cooked with both pause and tender, loving care, becomes, on its own, a work of art you are just about to enjoy and be mind-blown altogether. That’s where all of your senses will go through a massive wake up call almost instantly: the intoxicating smells, the gorgeous colours, the flavours, oh, my goodness!, the scrumptious flavours, the chill-out rather suggestive background music, the always attentive service making you all feel rather welcome at their home. Whoahhh! Did I say already how wonderfully overwhelming it can get? Well, it gets better. The desserts! Now I can imagine at this point in time you may be wondering about how expensive the restaurant is, right?, specially, after all of what I have mentioned above. Well, for what you get, it isn’t. It’s very good value for money. Not too expensive, not too cheap, just perfect. So much so you will realise, upon paying the bill, you will already start thinking about when you would be coming back again and at that point that’s when it will hit you: it’s not yourself who would want to come back to Samsara, but all of your senses, because they just had such a dumbfounding experience they would want to repeat it again. I can’t blame them. It’s a real treat for all of them. I know. Week #11 of the series of My Top 5 iOS Apps of the Week blog posts and it seems as if it was just yesterday when I was sharing my first entry over here of recommended iOS apps. I must admit I’m having a blast though going through each of the different screens of apps in both my iPhone and iPad Pro and challenge myself really hard whether I can continue to make use of one app or another that I would then go ahead and recommend on these blog posts. And if the answer is ’no’, I just go ahead and delete the app and move on. So far, I have been sharing over here about 55 of them, including today’s post, and I think I may have removed from my devices a few more than that, so it’s proving to be a rather good housekeeping exercise on its own, because it’s helping me focus quite a bit on figuring out what I want out of my iOS apps and ditch everything else. I think it’s far from going minimalist and everything, but if, so far, I have been able to remove for good several dozens of unused apps I think I’m on the right track towards just focusing on those that provide the most value, which, I guess, is what we should all be aiming for, after all, don’t you think? Either way, here we go again with another week of recommended iOS apps I find rather helpful and I hope most of you may find useful as well. The overall themes for this week are Productivity, Finance, Task Management and Photography. Notes: Well, this one won’t be much of a surprise to anyone out there, since it’s one of Apple’s own iOS apps that comes pre-installed in the operating system already, but I must confess, after iOS 10, it’s proved to be a rather noteworthy competitor from other note-taking apps. The integration between devices is just superb, seamless, almost instant. Sharing notes with others, or inviting them to chime into your notes, is a pretty nifty capability if you would want really easy ad-hoc collaboration for the not too complex interactions to work just right. But what I like the most about it though is its simplicity and immediacy to the point where it’s become my digital moleskin. I no longer write things down on paper, but on Notes on my iPhone, specially, while I’m on the move, making it incredibly easier to then work on those notes in whatever other device. At one point in time I even used it to draft some of my blog posts that I could then finish off in MarsEdit in my MacBook Air before I would go ahead and publish them across. Like I said, if you already have got iOS 10 installed, Notes is worth another look, for sure. It may surprise you and in a good way. 5coins: One of the many things you learn, early in the game, as a freelancer, is to keep an eye on both revenue and expenses, specially, the latter, so you can make ends meet month in month out according to the income you may have and live somewhat comfortably while still paying all the bills. And while I realise there are a number of different iOS apps to help you manage your finances quite nicely, one of my favourites, is 5coins. Uncomplicated, very easy to use, very light in terms of features and capabilities and incredibly helpful to manage your expenses without getting the usual headaches while trying to make sense of it all. Now, it’s not really fancy nor complex in terms of what you could do with it, but if you are looking for an app that can help you document your expenses really easy, keep an eye on daily, weekly, monthly and yearly expenses, as well as helping you visualise it all in a clear, straight to the point manner 5coins may well be it. You can export the data as .CSV files, you can add a monthly budget to help you stay on target, sync with iCloud and a couple of other features, but what I like the most is its immediacy in terms of annotating the expenses quickly and off you go! Worth a try, in case you may not have done it just yet. Clear: I mentioned in a previous blog post how there are a number of different note-taking apps I use in my iOS devices on a rather regular basis. Somehow I’m hooked to them for the variety of user experiences they provide, but there is also another category of apps I just can’t get my hands off and, of course, have multiple of them as well. Task management. Yes, I know, I have got a whole bunch of them I use regularly and I think I’ll start sharing along a few of them, so today, I am going to begin with Clear. Talking about speed and performance, those are two of the main features Clear excels at. Using gestures to mark as complete, or delete or create new items (tasks) is really good fun and it’s surprising how intuitive it can well be. Now, it’s probably not the best app to manage and handle complex tasks (from projects, team work, etc. etc. ), but if you are looking for something relatively simple to annotate your daily tasks without too much hassle and doing it all really quick, Clear may well be what you are looking for. Take it for a spin and you will see what I mean in terms of fun task management being taken into a whole new level. Productive: This is an app specially meant for you to help you build up on your own daily and weekly habits. And stick around to them. Whether they are related to health, fitness, home, hobbies, social, or efficiency, or whether you create your own, Productive helps you build a solid library of habits to execute on at different times of the day: morning, afternoon and evening. And reminds you, in a rather friendly way, so you can complete them accordingly. Obviously, it takes some effort to put together the different habits you may already have and some new ones you would want to build further upon, but once you pass that initial hurdle the rest is quite an amazing experience of helping your habits stick around in a fun, enlightening, and overall rather engaging way. My good friend, Bernie Mitchell, recommended it to me a few weeks back (Thanks ever so much, Bernie!) and after having played with it already for a good while, it’s a keeper. Why? Well, because it will help you stick to your habits and complete them accordingly effortlessly. That simple. That good. It just works. Lightroom [iPhone App]: Yes, I know, another week of recommended iOS apps and here I am, once again, recommending another photography app worth while looking into for your iOS devices, in this case Adobe Photoshop Lightroom and, specially, on the iPad Pro with the Apple Pen. Whoahhh! If you love tinkering around with your photos and play with all sorts of different effects and filters like a pro (without being one, for that matter! ), Lightroom is a pretty good choice altogether out there! It’s a whole new world of possibilities to discover and play with, but without having to go through an entire course around photography, which, at this point in time, I appreciate very much! I got this app recommended by Mauro Fuentes, a.k.a. @fotomaf, via an Instagram Story where he was entertaining questions to answer about photography, which is one of his many different passions. Yes, I know, those of you who already know him could vouch as well he is really good with photography, but Mauro is also very good at something else: sharing generously what he knows about his many passions, so that others become just as passionate about them as he is! So when I asked him which one was his favourite app for photo editing Lightroom was his first suggestion and after having played with it for a while he was right. Even someone like myself, who is nothing more than an amateur at photography, can get some gorgeous photo editing results with Lightroom in just a few steps. I am very thankful, indeed, for his recommendation, because more than anything else it’s opened up a whole new world of good fun, editing capabilities of pictures without going crazy as a result! So many many thanks, Mauro, for your generous help and guidance! I very much appreciate it. And if you get a chance, folks, that is, if you are still looking for an app to edit your photos from your iOS devices, Lightroom is a pretty good start altogether! Highly recommended! And that’s it, folks, for this week’s My Top 5 iOS Apps of the Week blog entry. Next week I will be back with another round of recommended iOS apps and, as usual, if there would be an app you would want to recommend yourself, reach out to me via Twitter at @elsua or leave a comment below and I will check it out and see if over the course of time, after I have used it for a while, I can go ahead and add it in an upcoming blog entry over here to recommend it as well to everyone else. Thanks a lot for your contributions shared across so far! Keep them coming, please. Hope you folks enjoy this week’s selection and till next time! If you have been reading this blog for a good few years already, you would know vast majority of articles over here have always been related to some of the main business topics I have been rather passionate about over the course of the last 20 years, whether it is Knowledge Management, Collaboration, Learning, Online Communities (and Community Building), Social Networking, Social Business and Digital Transformation, Productivity, and, of course, Work / Life Integration. You know, people often say, when you decide to start a blog, you should always write about the stuff you are truly passionate about, so that, as the years go by, you wouldn’t get tired of writing about such exciting topics that would allow you to keep up with your blogging mojo for many many years to come. I’m only now starting to realise there is something else I have been rather passionate about over the last few years that I haven’t written much about, at least, in the length I would have expected. And, with that, I guess it’s time to do something about it. And change it. Today. 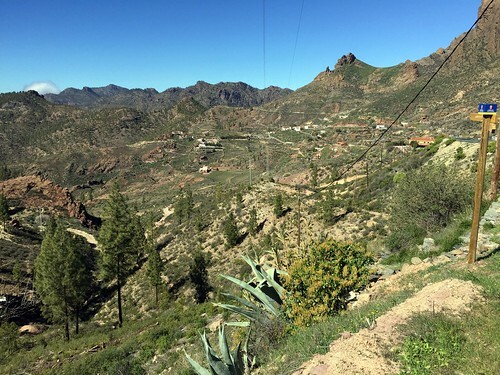 That’s why I’m kicking off this new series of blog entries under the heading ‘Gran Canaria – A Mini-Continent to Rediscover’. I know what you all may be thinking about, that you are going to unsubscribe really quick and stop reading this blog, from here onwards, as I write these few words, and never come back. That was it, you are done. So long and thanks much for all the fish! Good-bye! The thing is the fact I’m starting a new series of entries over here to write about one of my other passions, Gran Canaria, that may not be very much related to work, does not imply, at all, I will stop writing about the usual subjects I have been writing about all along, let me be clear on that one. I still plan to write, at least, 3 blog entries per week about business related topics and then, over the weekend, I will write one other post about the island I have been in love with since early 2004. And all of that because of a very specific reason altogether I think it’s now a good time to put down for good. As I have mentioned already, I have been living in Gran Canaria, one of the Canary Islands, Spain, for nearly 13 years now and time and time again I keep meeting up tons of people, some of whom are good friends of mine, or become friends over time, or they are just acquaintances who come and go as they holiday over here in the island. More often than not, I keep hearing from them how there isn’t anything else much to do in the island other than lay in the sunshine, go to the beach (or the pool), have a swim, perhaps have a mojito (or two! ), come back to the hotel, and enjoy perhaps one of the most disappointing dinners ever. And then repeat again for as long as the holidays would last. Ouch! Well, that may well have happened a few years back, but it’s no longer, necessarily, the norm. If you ask me, that’s, definitely, not what a refreshing and re-energising holiday in Gran Canaria should be all about, I tell you. It’s got a whole lot more to offer, if you care enough to look for it. Yes, of course, you can still get plenty of sunshine throughout the entire year, go and enjoy some of the most stunning beaches in the country, and have a drink or two before dinner, but that’s just the beginning. There is a whole lot more than that. That’s just one of the many activities you can embark on while you are staying in the island. And that’s exactly what I am hoping to share with you all with this new series of weekly articles. The same goes for food. You know, I am a foodie myself. Those of you who know me in real life could vouch for that, I am sure. I have always been one. In fact, before I went and started working in the IT industry back in 1997 I was a already cook for a good few years. And I loved it, I still do every single day, which is what I find incredibly surprising, because, upon asking those friends and acquaintances about the places where they had awful meals I keep saying, ‘No wonder, you are just going to the wrong places altogether! Gosh, believe me, I have tried most of them all out myself already! I know’. It’s what you get having lived over here for nearly 13 years and go out on a regular basis for a meal or a drink, which is something I really love doing, as it allows me to help a little bit with the local economy (I will share some more on what I mean about this one at a later time…) while, just as well, have a good time, too. Yes, indeed, getting the best out of both worlds. So when conversing with friends about this, I always get asked abut what nice places should they go out to for breakfast, lunch or dinner. Or what kinds of other activities folks could do apart from laying on the beach whole day long, having a drink and getting some much needed sunshine. Over time, one realises I keep repeating, over and over again, the very same stories, that is, the very same recommendations and suggestions, year in year out, to the point where it gets a bit too repetitive. And BOOM! Here it goes: I will blog them then, why not, right? That’s exactly the purpose of this series of blog posts. They are not meant to replace TripAdvisor at all or whatever other app people may use at the moment to get around places. In fact, if I take TripAdvisor’s noteworthy suggestions about places to eat & dine in Gran Canaria they are quite a few (nasty) surprises I would avoid (Yes, I told you, I have tried most of them all out already! Yikes!). So my intent with these posts is to keep it very informal, very down to earth, nothing fancy, nor too complicated, just blog weekly about a place, or an activity, to go / do and include a couple of items as to why I’d be recommending it based on my own experience living here and then share some additional pictures I may have taken as well. And that’s pretty much it. And who knows? 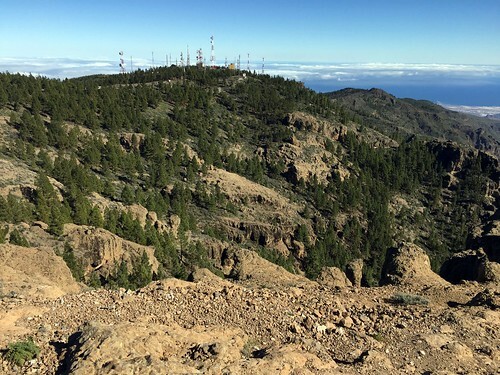 If other people out there, who may be reading those blog posts, benefit from such stories, suggestions and recommendations, about what else you could do while you are in Gran Canaria, all the better, right? That’s what working out loud has always been all about in the first place, open knowledge sharing about the stuff that matters to you, or, better said, in this case, that’s what living out loud is all about. Now, in the moment, carpe diem, making the most, every day, of the place I now call home. My home. And share it with everyone out there who may be interested in doing something different, because if there is something I have learned over time is that Gran Canaria has got a lot to offer. Care to join me and find out? Get in touch soon then! Let’s do it! It’s been a bit of a roller-coaster week so far leaving me with hardly no time to go ahead and put together the usual round of weekly blog posts, but I just couldn’t let this week finish off without sharing another entry to add further up into the My Top 5 iOS Apps of the Week series. Tomorrow I will be launching a new series of blog articles over here about something that’s been both in my mind and heart for well over a decade, but that I never dared it would come to light, and after giving it plenty of thought, tomorrow will be the day, at long last. So you can imagine how my mind, right now, is truly buzzing away which is why I need to do something else to keep me, well, … distracted. So what a better way of doing that than sharing this week’s set of recommended iOS Apps that you folks may want to have a look into and see if you would find them useful as well like I do. This week’s suggestions cover the following themes: Productivity, Photography, Traveling and Games. Reeder: In a previous post, I mentioned how my current favourite RSS news feed reader at the moment for iOS is Feedly. Yes, I know, I do still read RSS feeds. I am weird 😜. The thing is that Feedly is superb for when you are online, fully connected and everything, but when you happen to be offline you are out of luck, which is why I use in parallel another RSS news feed reader that allows me to read my favourite content from blogs and Web sites without being connected and that news reader happens to be the very same one for my iOS devices, as well as my MacBook Air. Of course, I’m talking about Reeder, my all time favourite app to keep in the know about what’s going on without having to hunt down hundreds of Web sites day in day out.I have tried out many feed readers over the last decade or so, whether on Windows, Mac or iOS, and Reeder has been the only one that I keep having installed in my various devices no matter what. It’s incredibly intuitive and very user friendly, it still works with OPML files, (Remember them?) and it allows me to help classify the different feeds based on folders / topics of what I’m interested in, which helps me keep things rather tidy while reading offline the various articles. So if you are looking for an offline RSS newsfeed reader for your iOS devices, walk no further than Reeder itself. It’s all you would need. Highly recommended, for sure! Opera Mini: I think I have been using Opera, the Web browser, on my desktop machines for the last 15 years, if not longer, and all along I have been truly in love with that browser experience. Yes, I know, in the world of Chrome, Internet Explorer, FireFox and Safari as the main options, it’s kind of awkward to admit I use a fifth browser: Opera itself. The thing is that even today, 2016, it’s still my default Web browser and for a good number of reasons, although the main couple of them would not be very much politically correct to mention them over here. I would suggest you download it, install it, play with it, and then you would know what I mean … So when Opera announced they were doing Opera Mini for mobile devices I just couldn’t help it and install it right away and till today. I rely on it quite heavily, along with Safari, of course, but so far it’s the main Web browser I use on my iOS devices. Main reason why? Well, two of them: speed and performance. When you are on the move on a regular basis you get to appreciate both of them and Opera Mini delivers quite nicely on both of them! A keeper, for real, if you are looking for alternative Web browsers with a twist. It has it. Prisma [iPhone Only]: Once again, and pretty much like the last few weeks of the series, one of the recommended iOS apps for the week would be one related to photography. In this case, one of the most innovative, creative and overall enticing apps you can bump into. I tell you, if you would want to apply some pretty funky filters to your photos and get your creative juices going, Prisma is as good as it gets, if not more! The overall user experience is just gorgeous and the outcomes are quite remarkable on their own. There is always a filter in the app that would fit everyone’s needs, regardless of your tastes, aesthetics, or quest for beauty. Prisma delivers and big time!As an example, I have shared a snap shot above of what it did to a picture I took of the London Eye a few months back when I was visiting there for a good few days. WOW! Just WOW! Kayak: If Trivago is currently the main iOS app I use whenever I need to book a hotel for an upcoming (pleasure or business) trip, in terms of booking flights without going crazy in the attempt my choice has always been Kayak. It uses pretty much the very same principle as Trivago does: a single user interface to look into multiple airlines and Web sites and find the best deal for your flights. It also helps you search for hotels, rental cars, etc. etc. but, to me, it’s booking the flight the one option I always end up with when heading to Kayak itself, specially, on my iPad Pro, where the overall user experience is pretty neat. So there you have it, that’s my trick, whenever I am on the road, and need to embark on a flight to a city and stay there for a couple of days, for work, or personal, the combination of both Trivago and Kayak is what it does it for me. I just love both of those apps! And that is it for this week, folks! That’s My Top 5 iOS Apps of the Week blog entry. Hope you get to enjoy the recommended iOS Apps I suggested above and next week I will be back with another round of apps I’m hoping you may be taking for a spin and see if you like them, just as much as I do. For me, it’s now time to go and explore some more new apps I have installed in the last few days, thanks to your wonderful feedback and recommendations!, and see whether they would stick around, and therefore I will include them in this series, or whether I’d go ahead and move on and try out some other ones. Thus keep that feedback coming further along, please, and thanks ever so much for those wonderful suggestions so far! It’s greatly appreciated, if anything, to confirm you may find these articles as helpful as I do. Way too cool! Week #9 of the series of My Top 5 iOS Apps of the Week blog posts and here I am, once again, ready to share further along the next round of iOS Apps I would be recommending for this week. And this time around with a bit of everything as the themes would be Productivity, Social Curation, Social Bookmarking, Photography and, finally, Traveling. I think I recall reading somewhere how the average number of installed iOS is roughly around 40, although I couldn’t find any recent statistic to confirm that, but if I judge by the number of blog entries I have shared over here recommending apps and based on my own user habits I would venture to state that figure is slightly higher for me. Probably, around the range of 60 to 70 apps that I use on a regular basis. How about you though? Are you on that range of 40 apps installed or a lot more than that like myself? Bear: I think at this point in time, you may have noticed how I have a slight addiction towards note-taking apps. I love them. I just can’t have enough of them, of playing around with enough of them and to then see which ones, over the course of time, would make it on my landing page regardless of the iOS device I use and stick around with them. In the past I have already talked about Ulysses and Scrivener, hugely impressive note-taking apps, specially, on an iPad Pro. Well, there seems to be another one coming up rather strong and it’s called Bear. I have only just gotten started to work with it in the last few days, after reading some rather interesting and noteworthy reviews and already I can see it has got a lot of promise! The markdown capabilities are incredibly powerful, and easy to grasp right away. The ability to switch in between devices, whether iOS or your Mac, is par to none, specially, the ability to start a note in one device and almost immediately continue working on another as if you have never switched. However, my favourite capability at the moment is how I can make use of hashtags to categorise the documents I create, so instead of using folders I can rely on those tags themselves, in the moment, to then be able to refind my own notes pretty easily, giving me a whole lot more control of how I organise things, as well as a bit more versatility in creating across the board connections of different notes based on the hashtags I use. Like I said, a pretty interesting and rather helpful addition into the note-taking app space. If you are into looking for some other alternatives, Bear may well be it. Worth a try, for sure! Flipboard: Do you remember Zite? Yes, I know, I too, miss it. It was my favourite online service, and by far, to be able to curate content across the board and fine tune the experience to match both my needs and wants while it kept learning over time what I’d find interesting and what not. Gosh, it was really good! I wish it would have continued, but, alas, Flipboard bought it and it started incorporating some of its amazing capabilities. So I started to rely more heavily on the latter from there onwards. While Flipboard is not Zite, it does a pretty good job in terms of helping you curate different streams of content according to your interests, ways of consuming links from different sources and other recommended sources. All of that put together in a rather enticing user face that resembles pretty much plenty of the gestures of reading a newspaper. It pretty much feels like that. However, my favourite two capabilities from this app at the moment are the fact I can create my own magazine from Twitter lists I may follow and you know I’m a huge fan of Twitter’s Lists and the second capability I enjoy quite a bit is its widget that allows me to access interesting news items without having to unlock my devices, which is rather helpful while on the go to get a glimpse of what’s happening out there. Refind: I have always been a huge fan of social bookmarking! In fact, it’s one of my favourite Web 2.0 capabilities from back in the day, right at the time when Delicious.com was just getting started. Over the course of last few years I have been using a number of different social bookmarking tools like Dogear, Delicious, BlinkList, Ma.gonila, Diigo, Pinboard, Inoreader, etc. etc. but for one reason or another they kept falling off my radar due to different reasons I won’t go into much detail today (to save you from the pains I have gone through losing thousands of saved items). Till I have found Refind. It’s my favourite social bookmarking tool at the moment and for a good number of reasons going from a delightful mobile user experience that just works, to an easy to use functionality to fine tuning your own interests on what you are aiming for, sharing capabilities, ability to save items for later reading, as well as a superb integration with other services like Twitter and Pocket, which are my two favourite apps to curate content and links I will be reusing later. Refind has got a lot of promise and it’s quite an interesting service for social bookmarking, but perhaps one other last thing that would be noteworthy would be how it learns tremendously well from your reading habits making the timeline incredibly useful and relevant for vast majority of cases, which is something I just can’t say from other curation sites. Refind would be worth while a look if you are looking for a social bookmarking service out there that still works. Snapseed: I think I’m building the good old healthy habit, with this series of blog posts, to every week share an iOS app around photography that folks may be able to check out and see whether they may find it useful. I mean, for my own case, I only use my iPhone 6S Plus as my camera, which means vast majority of my editing of photos happens either on my iPhone or, while importing it, in my iPad Pro. At this point in time I have an entire folder of Photography Apps, so I guess that’s going to keep me busy for a little while longer. This week’s suggestion though is perhaps one of the most popular apps out there for iOS photo editing: Snapseed. It’s perhaps the most user friendly app out there you will find to edit your photos without giving you the feeling you need to be a pro to get a good result out of it. The in-depth capabilities to give your photos almost any kind of effect is outstanding and the wide range of filters will keep you busy for a good while deciding which one you would apply and stick with it. That, one its own, is going to be a tough, although equally fun, dilemma that will entice you to spend a good amount of time within the app trying to figure out which one would be your favourite pick to share elsewhere on digital tools. Of all of the photography apps I use Snapseed would probably be, easily, within the Top 5. It’s that good. Trivago: And, finally, last iOS recommendation for this week. Now, I don’t get to travel as much as I used to back in the day, but whenever I’m off on a business trip, or on holidays, my number one app (by far!) to check for hotels at the best prizes knowing I will get it all without having to go through multiple sites would be, without a single doubt, Trivago. Even more so to the point where if I know which city I will be going to and I’d have a favourite hotel to stay in there, I will still make use of Trivago itself to find me the best prizes for me for that particular hotel as it does check multiple Web sites for me and lists them all nicely. I just need to browse through them, find the one I like the most and make the booking directly from there. That simple. And that’s it, folks, for this week! That’s My Top 5 iOS Apps of the Week blog entry. Next week I will be back with another round of 5 iOS Apps I’d recommend you give a try, and if there is any app out there you’d want me to give a try, play around with and share some thoughts about what I think about it over here, let me know in the comments or in Twitter via @elsua and I will be more than happy to check them out! While I keep working on the drafts for the couple of upcoming posts on additional perks of freelance work, as well as some of its setbacks, I figured I may as well put together the next blog entry from the My Top 5 iOS Apps of the Week series. Even more so as an opportunity to keep things rolling with a good effort to take my mind away from the reflection time I am going through at the moment having witnessed, perhaps, one of the most profound and rather mind-boggling changes that may have happened in our recent history and that I’m sure everyone is very aware of, given the recent date in which it took place. My mind is, currently, very much distracted reading, learning and pondering further along about everything that’s going on, so those other more meaty articles would need to wait for a little bit while I get back in shape in the next day or two. Thus hang in there for a bit more time, please, if you were looking forward to those articles around freelancing. They will be coming up shortly! For now, I would like to continue with the My Top 5 iOS Apps of the Week series and move into Week #8, which is really interesting, because when I first got started with it, a few weeks back, I never thought I’d be taking it this far highlighting and recommending already 40 different iOS Apps I use on a more or less regular basis. In fact, it’s even more intriguing when I look into my iOS devices and I see I still have got those many, if not more!, to include in this series for upcoming weeks, so it looks like I’ll be busy with it for a little while longer. Overall, I’m enjoying, quite a bit, the opportunity to blog about these apps, because it also gives me the good chance to go deeper into other tabs and folders within my gadgets that I haven’t been to for a while and question whether I would still want to make use of some of them, and if not, whether I’m ready to ditch them for good and never come back. I didn’t expect this blogging exercise would allow me to do massive housekpeeing and remove all of those other apps I haven’t used in months now, but it has. And it’s more than welcome to help me continue with it. If anything, it’s been quite liberating altogether just as if it were spring cleaning! Thus, for this week, I’ll be recommending apps in the areas of Business, Productivity, Photography, Music and Reference – News. Ummo [iPhone Only]: If you have recently been doing public speaking, whether just getting started with your first speaking gigs or whether you are well seasoned public speaker, you know delivering a speech / talk is no easy task. There are tons of things to take into account: the pitch itself, the visuals, the delivery, your posture, your enthusiasm, your passion, your nerves, the ideas you’d want to share across, you name it. The list goes on and on and on. You wish you knew what else you could do from the several thousands of articles, blog posts, books, white papers, etc. etc. out there that presumably advise you on what you need to do to become a better speaker and while all of those resources may be helpful, you still feel you could even learn plenty more. Well, take a look into Ummo. You may wonder why you didn’t have this app a long time ago! It’s one of those apps that will essentially analyse your pitch and then advise you wisely on how you could improve your own public speaking skills based on what it discovers about you and your delivery style. MacStories, as an example, has written, not long ago, an excellent, and rather detailed, review of the app itself you may want to go through first, before you may decide to take it yourself for a spin, but I tell you, if you are into public speaking and would want to spice up a fair bit your own skills, this is a must-have app. Without a single doubt! Scrivener: In a previous blog post from this series, I mentioned how one of my favourite iOS apps for uninterrupted and focused writing was Ulysses. Back then, I mentioned how there are a couple of other apps I quite like as well for writing long form, without distractions on my iPad Pro, so for this week, if Ulysses doesn’t cut it for you and if you would be open up for other suggestions I’d like to suggest you take a look into Scrivener. Perhaps, the most powerful writing and note taking app out there at the moment. In fact, if you have been using it on the desktop I don’t need to mention anything else other than it’s now available for iOS, too! And it rocks, big time! I still haven’t decided just yet which one of the two of them would become my default one for my iPad Pro, so I have decided to make use of both of them for the time being and get the most out of them. Since both user experiences are rather different and very unique, all the better. Like I said in a previous blog post as well, it’s about having a choice and in this case we are very well served with both of them! PhotoSync: When talking about photography apps, PhotoSync is probably one of the essential Top 5 Apps, if you are keen on transferring your iPhone / iPad photos on to your desktop (in my case MackBook Air) without having to make use of iCloud per se. At the moment, it’s the main app I use for all of my iPhone photos to be copied across into my MacBook Air, connecting over the same WiFi network, selecting the folder or photos I’d want to move and off it goes. Job well done and painlessly. Shazam: What can I say about Shazam that may not have been said before already? If you are really passionate about your music tunes, but, alas, you are terrible at remembering either the singer or the title of that particular song, let Shazam come to your rescue! There are tons of features and neat capabilities I really like about this app, but there are two in particular that I’m just in love with: first, the fact I can trigger it from the home screen itself with its widget without having to first unlock, open up the app and tag that song, making it all really quick and friction free, which is what you want when you are on the move, listen to a piece of music you may not recall, but may be interested in and BOOM! Shazam has it for you! Secondly, the fact it’s fully, and beautifully!, integrated with Spotify, so it allows me to build Spotify Lists pretty neatly directly from the app itself that I can then start listening to in Spotify. Talking about integration of apps done right! Yes! It works just perfectly! Otto Radio [iPhone Only]: And, finally, one of those rare recommendations that blew my mind when I first bumped into it, by chance, a few months back. Otto Radio taps into the world of podcasting, and news broadcasting radio, and what it does eventually is speak out loud to you different news items, as if you were listening to the radio, and then reproduces snippets of podcasting episodes that may match the interests you have already selected. And if you like them, you can then get the rest of the episode, but without having to subscribe or download the episode itself. All of that nicely packed in different time slots you select ahead of time, so depending on how much time you may have, while commuting, exercising, or waiting for other work to finish, you make your time selection and off it goes, all nicely packaged for you. Ready to be listened to and enjoyed. Ohhh, and the more you use the app, the more effectively it learns about the news items that tick for you and the better its fine tuning capabilities. Of all of the new iOS Apps I have tried this year so far, it’s perhaps one of the best out there, specially, if you are a news junkie, or if you just want to be in the know about what’s going on out there. The way it entices you to stick around and engage with the app is really good as well. Wish other apps would learn from it. Remember Zite, by any chance? Well, it’s that good, but with audio / podcasting snippets. Highly recommended! And that’s it, folks, for this time around! Next week I will be putting together a new set of iOS apps I am hoping you would be enjoying as much as I do and, again, if there is an app out there you would want to recommend I give it a try, please leave a comment below or let me know via @elsua in Twitter, where a few folks have been sharing their suggestions as well through Mentions. Thanks ever so much for sharing them across and till next time!